Spanish explorer Sebastian Vizcaino arrived on Dec. 4, 1602 at the California coastal plain he named Santa Barbara. Who loosen the last window on the sun of sudden death. Although the post-Vatican II Roman Catholic church has booted her from the liturgical calendar as a probable legend, this is the feast date of still-popular early Christian martyr St. Barbara. There are a million fishy details of the story: nobody’s clear on which anti-Christian persecution claimed her; nobody’s clear on where in the Roman Empire she died; and it’s hard to keep a straight face at the clincher that her unsympathetic pagan father gets struck by lightning after her execution. Actually, the story is practically straight out of a fairy-tale reader: nasty rich dad Dioscurus locked her up in a tower like Rapunzel, but flew into a rage when he discovered she had secretly become a Christian, and dragged her to the Roman prefect to be tortured and, eventually, beheaded. There are any number of further variations, like that mean old dad personally gave her the chop. She’s best known as the guardian of miners and artillerists — folks who work around explosions, like Guy Fawkes — and the word santabarbara denotes a powder magazine in both Spanish and Italian. 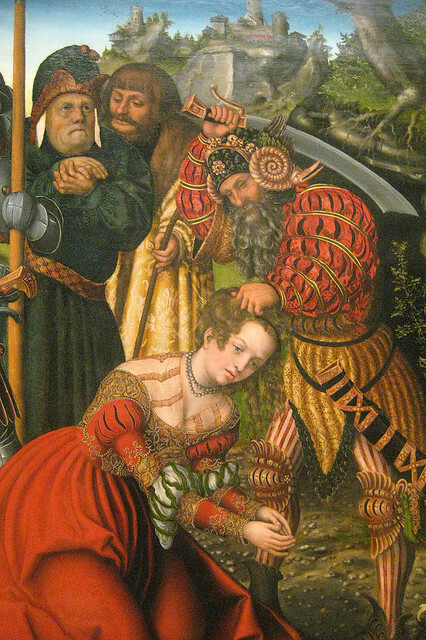 The Martyrdom of Saint Barbara by Lucas Cranach the Elder, c. 1510, is clearly sensible in the swarthy, scimitar-wielding executioner of the contemporary-to-Cranach Turkish menace. (cc) image from Wally Gobetz. Is her patronage of people who make things go bang the reason for her identification with Shango in Santeria?